Poetry by Roo Borson, Steven Heighton, Sylvia Legris, Barbara Nickel, John Reibetanz; Fiction by Kate Cayley and Maria Reva; Creative Nonfiction by Jennifer Bowering Delisle. Six finalists have been chosen by the judges (Mark Anthony Jarman, Stephen Marche, Joan Thomas) for this year's Novella Prize. $1500 will be awarded to one winner... stay tuned for the big reveal on April 8! See the list of finalists here. On Love, Levity, and the False Brave Face: Michelle Brown talks with Issue #194 contributor Martin James Ainsley about family relations and the call of a shiny red '69 Chevy in his poem, "Muscle Car." This poetry-rich issue opens with a moving last-minute addition from Phyllis Webb: “Gwen, I didn’t know it had been so bad, such a long / way down these past months….” Gwendolyn MacEwan had passed away just a few weeks earlier, and Webb’s raw response opens the issue. 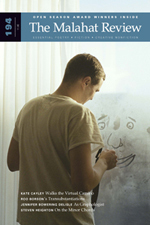 Read more about Issue #81. Far Horizons Award: $1000 to One Emerging Poet! It's closer than you think! 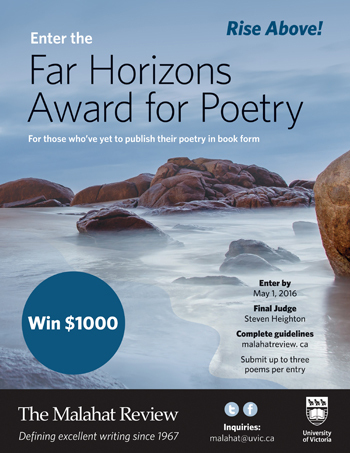 The deadline for our biennial Far Horizons Contest is May 1, and we're giving away $1000 to one poet who has yet to publish their work in book form. Think you have what it takes? Send us up to 3 poems per submission (line limit per poem = 60). Multiple submissions are welcome and encouraged! Full contest details and submission guidelines here. This year's contest judge is Steven Heighton. Check out his interview below with Adèle Barclay, and get tips on what he's looking for in the winning poem. Read a past interview with Laura Ritland, winner in 2014. Adèle Barclay talks with this year's Far Horizons contest judge, Steven Heighton, about his search for the winning poem, with key tips for writers: interest, failure, and oblivion are all part of the process! AB: You’re a prolific writer of poetry, novels, and short stories. How does your prose writing inform your poetry and vice versa? How do the forms overlap and what does poetry allow you to distinctly explore? SH: I'd say that prose doesn't much get into my poems. At least I hope not. My poems are more lyrical than narrative. So there's little overlap in that direction. Alas, in the other direction... Writing a novel, or even a 25-page story, while paying attention to the language like a poet (ie, on the level of the syllable instead of the sentence) is slow death, but what am I to do? A writer's ear makes certain demands; you can't walk away from a sentence until it feels right. Read the rest of Steven's interview on the Malahat website. Established in 2007, the P. K. Page Founders’ Award recognizes the best poem to have appeared in The Malahat Review in the previous calendar year. We're pleased to announce that Danny Jacobs has won this award for 2016 with his poem, "Fatberg," which first appeared in the Malahat's Spring 2015 issue. Fiction board intern Joseph Leroux recently interviewed Danny about his win. Click here for the full list of 2016 Founders' Award winners. JL: You’ve written a lot of poems about middle-class working life, the most obvious being the call centre poems, like “What the Walls Said.” With “Fatberg,” the theme of work continues, shifting onto a new subject, one which also comes with its own esoteric language. Why do you think you revisit languages of work in your poems? DJ: Specific fields of work each carry their own little jargons and language pockets. Call centres were interesting to explore poetically because they’re a microcosm of acronyms and business argot. Work (jobs outside of writing) has been, I think, very fruitful for many writers for this reason—the insider slang, the terminology, the sometimes beautiful institutionalized language, the on-the-job machinery that creates its own linguistic machinery inside of the poems. One revisits languages of work for that idiomatic specificity—the cool sounds outside everyday speech. Read the rest of Danny's interview on the Malahat website.